These beautiful studs feature eight round cut diamonds surrounding a larger centre stone in each, This illusion style setting gives the impression of single larger diamonds of 1.25ct each. 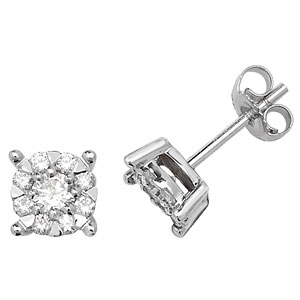 Set in solid 9k white gold with standard post and butterfly fitting for pierced ears. Delivered free with luxury packaging, authenticity certificate and a full 12 month guarantee.